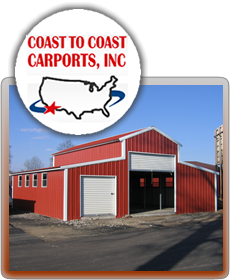 There are many advantages that a metal pole barn from Coast To Coast Carports, Inc. has to offer farmers. A pole barn can be constructed at a much lower cost than traditional barns; yet still remain sturdy and reliable. Coast To Coast stands out among other pole barn manufacturers, because we only uses the highest quality of steel when constructing our barns. When you choose to get a barn from us, you are making a worthwhile investment that will benefit you and your farm for years to come. There are several reasons why getting a barn made of steel is such a good decision. First, steel buildings can be built and assembled quickly, so that you can start using your barn as soon as possible. Second, our steel will provide protection to your valuable livestock from harsh temperatures, unpredictable weather, termites, and fires. Unlike other materials commonly used to construct barns, steel is not susceptible to water damage. Your metal pole barn will last for years to come, with little upkeep required on your part. Our metal barns are also completely customizable to fit the unique needs of your farm. When you order a metal pole barn from Coast To Coast, our friendly team will work with you to customize the features of your barn to your satisfaction. You will have the choice to specify everything from the size and style of your barn, to the windows and doors. We also have a large color section available to you, in order to make sure that your new barn will match your property. Get in touch with us today, and get started on the process of getting your own specialized metal barn from Coast To Coast.